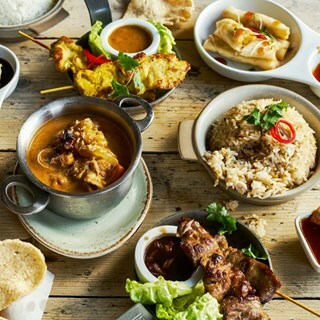 Giggling Squid brings the simple, rustic , fresh food of Thailand to Guildford. From street food to coastal specialities. Eat at Giggling Squid for startling flavours, amazing colours, and original textures. Great food, amazing and personal service. The lighting was way too bright , unlike your Henley and Marlow branches where there gave a much nicer atmosphere . Also staff started cleaning up around us whilst still dining at 1030 pm and seemed agitated when we asked for another drink! We were sat near the door which was constantly being open and shut and it was cold. Starters were lovely but the pad Thai was like a plate of oil! No one came to see how our food was, not offered any more drinks throughout the evening. Fantastic service and great food. Little cold sat near door though! We were pleasantly surprised by how lovely the food was! We’ll be back! Starters took over 30mins to arrive, half of the starters were cold. We complained and the staff took this off our final bill along with dessert which was a nice touch. The cod I had was overpowered with too much fish sauce but the Penang curry was very good. The food was so tasty and plenty of choices too. Need to go back to try more dishes! Booked on behalf of 10 business colleagues and the feedback was highly positive. Many thanks. enjoyable eve. fairly quiet as it was Sunday. lovely waiter, very friendly and he had a good sense of humour. Fantastic service from Harry - very friendly, chatty, lnowledgable about the menu. Food was great and he warned me the Jungle Curry would be hot! So suggested coconut rice which was perfect. Quiet as it was a Monday evening but 2nd visit in 2 weeks and will return soon! Lovely experience. When there had been an issue with my starter which resulted in a long delay, the lovely waitress kindly deducted this from the bill and was very apologetic. Lovely atmosphere, kind staff and fantastic food. Will definitely be returning and recommending to friends and family. Have just tried the Giggling Squid for the first time. Loved the whole concept-food was delicious and atmosphere was fab! Lovely atmosphere and friendly staff. Pad Thai was not hot when it first came out so had to send it back, also not as tasty as in some Thai restaurants which is a shame as this is usually a favourite that kept us returning to others. However all the other food was very tasty. Having finished all food and drink we had to prompt waiter for the bill as we had waited for a while. First visit to Giggking Squid Windsor and would definitely come back. Very friendly staff and the food was excellent.